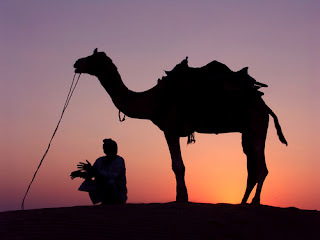 Appukuttan walks into a restaurant in Abu Dhabi with a full-grown camel behind him, and as he sits, the waiter comes over and asks for their order. Appukuttan says, 'Enike nalu barotayum oru motta roast,' [I want 4 porottas and 1 egg roast] and turns to the camel, 'Ninnake endanu vendiye?' [what do you want?]' 'Ennikum adhu thanne,' [ I'll have the same] says the camel demurely. A short time later the waiter returns with the order. 'That will be 15.30 dhirams please,' and Appukuttan reaches into his pocket and pulls out exact change for payment. The next day, Appukuttan and the camel come again and Appukuttan says, 'Enike nalu barotayum oru motta roast''. 'Ennikum adhu thanne,' (ditto) says the camel demurely. Once again Appukutt an reaches into his pocket and pays with the exact change. This becomes a routine until late one evening, the two enter again. 'The usual?' asks the waiter. 'Innu vyazhazhchai alle, enniku 5 appavum oru kozhi stew,' [ today is Thursday so I'll have 5 appams and chicken stew] says Appukuttan. 'Ennikum adhu thanne,' [ same for me ] says the camel demurely. A short time later the waiter comes with the order and says, 'That will be 12.62 dirhams.' Once again Appukuttan pulls exact change out of his pocket and places it on the table. 'That's right! Whether it's a gallon of milk, a Benz car or a Roll Royce , the exact money is always there' says Appukuttan. The waiter asks, 'One other thing, sir, Ningal endina ee ottakathinem kondu nadakunnathu?'' [why are you always accompanied by this camel]. There is always a catch when you get your prayers answered. P.S. Don't miss the tomorrow Sunday's joke. I bet you would laugh until your pant falls down. i like simplicity of your jokes.. Laughing is the best medicine. I'm glad I could make you laugh.